Step through the big red doors at the Barn on 26, and step back in time. This wonderful Shaker built barn, circa 1870, is filled with antiques that will speak to you from centuries past. Carefully restored oak, walnut, mahogany and pine pieces, all with stories to tell, will greet you as you browse through the shop to find the perfect antique for your home or office. 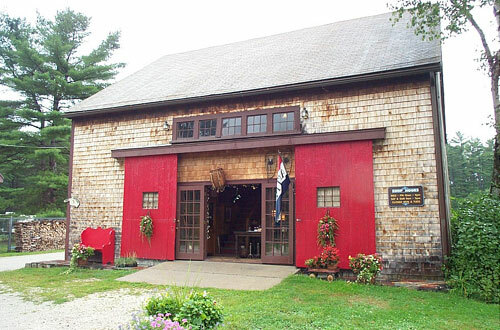 Previously featured in Down East Magazine (Nov. 1997), the Barn on 26 was referred to as "the Go-To Place for Antique Oak", and thousands of loyal patrons who have discovered this shop throughout the last 27 years have found that to be true. Walking through the doors is truly a "discovery" for folks traveling inland toward the picturesque Western Maine lakes and mountains. The pastoral country setting of the Barn on 26, beckons, encouraging travelers to "take pause" and linger in the surroundings of days gone by. You, too, are invited to step in and enjoy the undiscovered antique treasures inside this lovely shop. Welcome to the Barn on 26! The Barn on 26 features a full selection of dining room and kitchen tables, chairs, desks, filing cabinets, beds, dressers, chests of drawers, commodes, hall trees, mirrors, lamps, clocks and accessories to add a bit of charm and tranquility to homes and offices from any era. Some items are offered in original condition, although most have been meticulously restored by a small team of professionals, who have brought the pieces back to life. Using the proper techniques and products, these craftsmen allow the patina to shine through, spanning the centuries and preserving heirlooms for future generations to enjoy.